Since 2009, the GRAMMY-nominated Los Angeles Percussion Quartet (LAPQ) has forged a distinct identity as a world-class contemporary chamber music ensemble that is dedicated to commissioning and presenting new works for percussion quartet. Founded to create a classical percussion ensemble that would champion contributions of 20th century West Coast composers while collaborating with local artists to continue innovation and exploration. 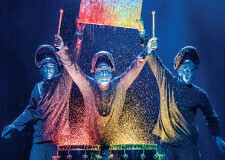 LAPQ has contributed some of the most dynamic and captivating recordings of percussion music to date earning multiple Grammy nominations and “Best of” lists from iTunes and NY Times. In addition, they are dedicated to engaging with young composers and performers to share their knowledge of percussion music. Through commissioning projects and masterclasses, LAPQ educates developing artists with direct creative collaborations. LAPQ are Yamaha Performing Artists and endorsers of Innovative Percussion, REMO, Black Swamp Percussion, and Sabian Cymbals. Yamaha Corporation of America, Black Swamp Percussion LLC, Innovative Percussion Inc., Remo Inc., Sabian Ltd.